The IceBox in Lincoln, NE turned into a haunted house for the Stars on Halloween night as the visiting Waterloo Blackhawks scored five of the first six goals scored to cruise to a 6-4 victory. With the loss, the Stars dropped to 3-5-1 (7 points) and are now tied with the Sioux Falls Stampede for last place in the USHL western conference. Click here to view the current league standings. Waterloo improved to 4-3-2 (10 points) with the win, which was their sixth in a row against the Stars dating back to last season. The Blackhawks outscored the Stars 28-9 in those six games. I knew Waterloo had Lincoln's number as of late, but I didn't think it was that bad. It's always a bad matchup for Lincoln. The Stars found themselves behind the 8 ball very early on in this game as the Blackhawks scored on their first shot just 34 seconds in. However, the Stars answered quickly when forward Grant Jozefek scored his first USHL goal on an incredible shot about four minutes after the first Waterloo goal. Grant skated into the Waterloo zone on the left wing before ripping a beautiful shot that beat Blackhawks goaltender Hayden Lavigne high, glove side. Waterloo added another goal halfway through the first period to take a 2-1 lead. Some miscommunication behind the Lincoln goal allowed Waterloo to take advantage of a Stars turnover. That score would last to the first intermission. The Blackhawks outshot the Stars 8-6 in first twenty minutes. For the most part, I thought both teams were evenly matched in the first period. I hate to sound like I'm a negative nancy, but the first 10 minutes of the second period was as bad as I've seen the Stars play at the IceBox in a long, long time. Defensively, it was a train wreck. They couldn't get the puck out of their own zone, and when they did finally get posession of the puck, the immediately gave it up. It was just ugly hockey, and Waterloo scored three straight goals to start the second period to take a commanding 5-1 lead. Stars goaltender Cam Hackett, who started the game for Lincoln, was pulled after the fourth Waterloo goal. Peyton Jones played the rest of the game in relief of Hackett. As bad as Lincoln played in the first half of the middle period, I thought they played pretty well in the last half. Dominick Sacco scored Lincoln's first shorthanded goal of the season on a breakaway to make the score 5-2, Ludvig Hoff scored later in the period to give the Stars some life, down only two goals at this point. Heading into the second intermission, the Stars trailed the Blackhawks by a score of 5-3. Shots were 17-6 in favor of Waterloo in the second period. For the most part, I thought Lincoln was the better team in the third period. They outshot the Blackhawks 15-6, but were only able to get one of those 15 shots past Lavigne. Waterloo added a shorthanded goal in the third period to complete their scoring. Waterloo's sixth goal of the game was scored by forward Brock Boeser, who had a hat trick (and 1 assist) against the Stars. Michael Gillespie's third period goal at the 5:32 mark completed the scoring for both teams. Gillespie now leads the Stars in goal-scoring with 6 in 9 games. Take away the first 10 minutes of the second period, this was a pretty even game. But those 10 minutes were so, so bad....Lincoln could not recover. Total shots were 31-27 in favor of Waterloo. Both teams were not very successful at all on the powerplay. Waterloo went 1-for-7, while the Stars went 0-for-7. Good and bad special teams for Lincoln in this game. The PK looked great, and is improving compared to earlier this season. The PP unit, however, is a mess. Stars are better off playing 5-on-5 than playing a man up. Cam Hackett stopped 20 of 24 before he was pulled in the second period. In relief, Peyton Jones stopped 5 of 7 and picked up the loss. Great to see defenseman Dylan Woolf back in the lineup last night after missing all of the preseason and 8 games of the regular season due to injury. He's a big kid who loves to throw his weight around. The boarding call called against him by referee Todd Lacina in the second period was a joke. It was a very clean hit. 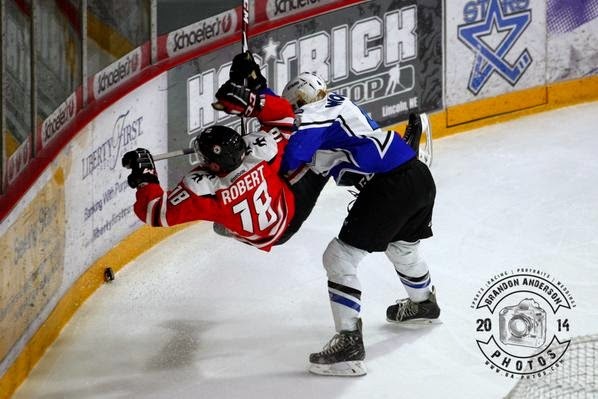 See the photo below of the hit in question, taken by Brandon Anderson. Speaking of Todd Lacina, I doubt he'll be getting a Christmas card from Stars head coach Chris Hartsburg this year. Hartsburg called out the officiating after the game when talking to Stars radio announcer Mike Melbye. 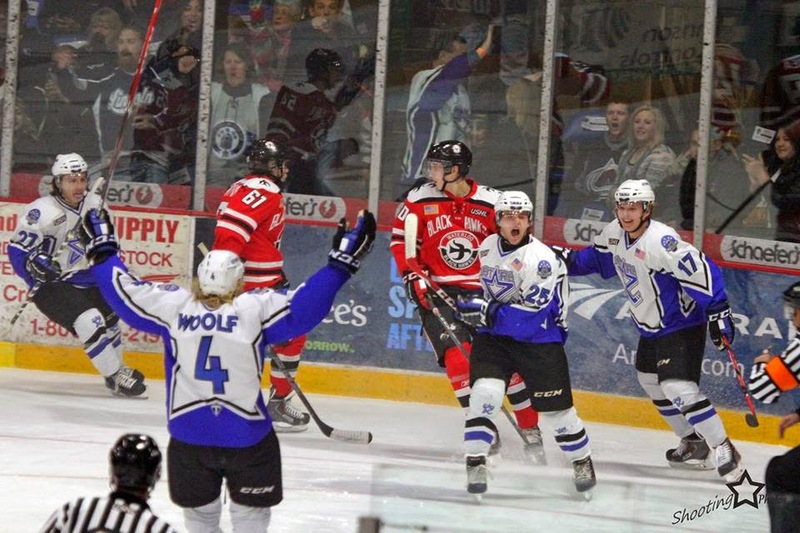 Stars are back in action this upcoming Friday at the IceBox against the Sioux City Musketeers. The following day on Saturday, the Stars will be in Des Moines, IA to battle the Bucs. Another big test for Lincoln next weekend as the Muskies and Buccaneers are the top two teams in the USHL western conference right now. Edit: Check out the video below from Brandon Anderson that has video highlights of the game and post-game comments from head coach Chris Hartsburg. Love watching the Stars but its tough not seeing them win. I agree that the second period was rough. Definitely need to pick it up. I felt that the goal tending in the early half of the game left some to be desired. The second half of the game the goal tending picked up and felt like there was some passion and drive. Without the want and the will in a goal tender they probably won't be able to hack it. can't help but think the numbers on P. Jones are way off-- not doubting the 3rd period numbers, but his 2nd period stats look unbelievable.....if waterloo had 6 shots on goal in the 3rd then that means Peyton only faced one shot in the middle frame and I know he faced way more than that. Also, I'm a little baffled by our attendance numbers this year, what with the new coach and a very exciting young team, I would have thought we would be drawing alot more fans this year but so far our numbers seem way down--this is a fun team Lincoln--get out there and show somsupport!! I see a lot of passion and heart in P Jones. Definitely a fun goalie to watch . I agree as well with the attendance . we used to be the attendance leaders. Now we can't even fill half of the ice box. Stars fans are the best fans in the league and we need to show that. Get the icebox full and rowdy again! -They just don't have a legitimate 1st line goal-scorer. The effort is there, but there are no elite goal scorers on this team. Not even close. So they have to work that much harder than the other team to manufacture goals. -Consistency. They lack it big time. One period they'll play fundamentally solid hockey. The next period they'll play like a pee wee team. In the second period, I saw a lot of players just going through the motions. Lots of passengers, no leaders. -I never thought the PP would look worse compared to the past few years under the old coaching staff, but it does. What's the expression about a monkey and a football? The season is still young so I'm not too worried. I don't think this is a playoff team, but they should improve to be a .500 team. If they still have the same issues noted above after 25-30 games then I'll be concerned. Maybe I need to listen to Hartsburg's comments again, but I don't remember him calling out anyone. I remember him talking about Hoff, and how he had a good game against Waterloo but hadn't been playing that well previously. Personally, I don't have a problem with that. I'm guessing you weren't around when Steve Johnson was coach. He definitely didn't have a problem with pointing out a player who could improve. Seems like too many people are ready to jump ship already. We are only nine games in. After watching the game in the 2nd period Hackett was pulled at 3:32 of the 2nd. Jones came in and faced 13 shots and gave up 1 goal. That is not what it says on the recap of the game. At this level you would think they would get this right. I have been a manager for 8 years and I know how important goals.assists and GAA are. I would hope someone would go back and look at this game and get it corrected.